This is the first of a series of post-hurricane-catch-up posts that I’ll be writing–I did lots of cooking and baking while Sandy was happening, but was wifi-less for days (THE HORROR), hence my lack of posting. But I’m back! Lucky for me, we didn’t get hit too hard by the storm. A few power outages, fallen trees, and the loss of internet was all we really had to deal with. A huge part of downtown was not so lucky. Love you, New York. Stay safe. This recipe was the result of a baking void build up from a few days–I needed to make something, but I didn’t want it to be unhealthy. All I did during the hurricane was wake up, eat, watch Law and Order SVU, eat more, shower more than necessary, eat, etc. We weren’t allowed to leave our homes, okay?! What else was I supposed to do? Anyways, after almost an entire week of constant eating (mostly those brownies in the last post), these granola bars were what I needed. They’re delicious, easy, and portable. And who doesn’t love granola bars? Warning: these are not super sweet. If you’re looking for a Chewy-bar-caliber sweetness, do not look here. The only thing I sweetened these with was banana; if you want something more, you could always add sugar or honey! Easy fix. I really wanted to make these a little more exciting by drizzling some melted chocolate over the top, but my chocolate chips mysteriously disappeared. I kid you not, I’m not even being sarcastic right now. They were in the cupboard last time I checked! Anyways, until I get more, these will have to do. Not the worst thing in the world! They were yummy either way. Preheat the oven to 350 and grease an 8×8″ pan. Put your bananas in a large bowl and mash with a fork (or your HANDS if you’re daring!) until as many lumps as possible are gone. You’re not going to be able to get all of them; don’t fret. Add your nut butters and mix until combined. Add your dry ingredients next and stir until everything is incorporated. Maybe add 1/2 c. or so of chocolate chips if you have them! Bake for 20 minutes or until the edges are lightly browned and the center is firm (but still gives a little). Wait until the bars cool completely before cutting! I cut mine into 10 granola-bar-sized bits. It worked out nicely. Can you tell I love almonds? 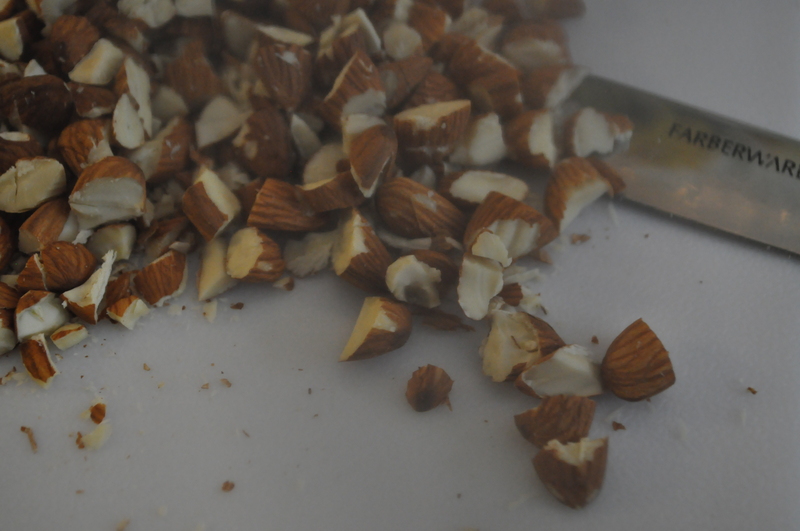 You could obviously add any other mix-ins you want to this, but I wanted to keep it a simple chocolate-almond combo. Dried fruit would be yummy, chocolate chips, coconut, etc. Go crazy. 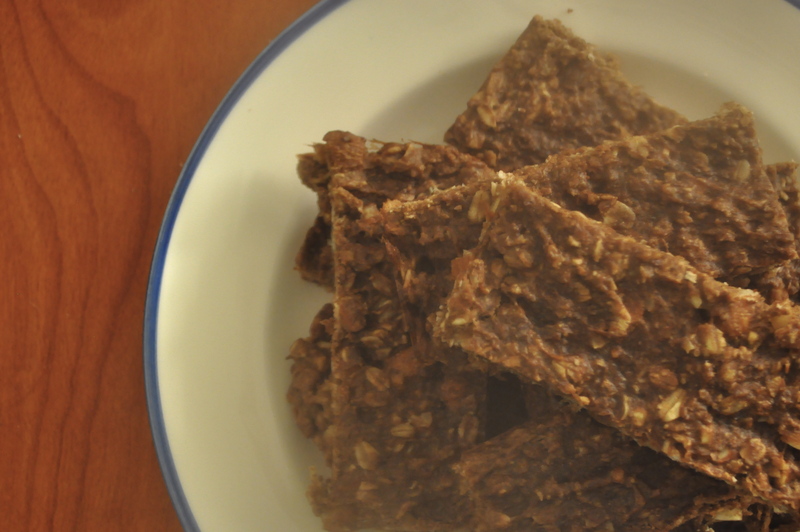 If you’ve never made your own granola bars before however (I hadn’t! ), I highly recommend it! It’s honestly so simple. Aaaand cheaper. And so fresh! And there are no funky ingredients! And, last but not least: you can customize them. What’s better than that? Categories: Breakfast, Snack | Tags: almond, breakfast, chocolate, granola bars, snack, vegan, vegetarian | Permalink.